One of the exciting things about my new home in the Swiss Chablais is the mind-boggling array of world-famous cheese produced all around me. This is where raclette, Switzerland’s most iconic melting cheese comes from and I have recently discovered a beautiful mountain farm I can hike to that produces an excellent version of it. The regions of Emmental, Gruyere, Abondance, Beaufort, Mont D’Or, Comte and Etivaz are all less than an hour and within this same range Reblochon, Tomme de Savoie, Vacherin Fribourgeois, Morbier and Blue de Gex (to name just a few) are also produced. So you might ask, why go to the trouble of making my own? At Petraia I made fresh cheese almost every day for the restaurant using our own sheep’s milk and over those years I learned a lot about the seasonal properties of milk. Early spring is the time the animals take back their pastures. The grass they are grazing on is new, tender and sweet. It’s as good as it gets now and so is their milk. If you can find fresh milk from pastured animals this is the one time of year making your own fresh cheese is something worth doing. This is the purest, simplest cheese there is and as easy to make as fresh yogurt. That means it is dead easy. My favorite milk to use is sheep’s milk. It’s sweeter and richer than cow or goat milk and it yields more cheese. Milk from a cow tastes thin and watery by comparison and goat milk has a stronger animal taste I am not particularly fond of. Sheep’s milk has delicate floral notes at this time of the year and only a light hint of the animal. As the season progresses that animal taste gets stronger and green grass notes appear. In the fall the milk tastes of hay and the animal flavor is the most pronounced. In the traditional cycle, cheese is not made in winter when the ewes are either pregnant or nursing. In early spring they give birth making lamb the meat of choice for Easter in many European countries. If you can find sheep’s milk now, you might want to stock up. It freezes well and you can use it to make either fresh cheese or beautiful, thick yogurt. Making a traditional aged cheese with cultured milk is a craft and learning how to master it takes years, sometimes even generations. Ideally you also should have some specialized tools not to mention perfect conditions for aging. This is not an easy thing to do well at home or in a restaurant kitchen. I learned this the hard way when I tried it at Petraia and sent our first samples to the lab for testing. I wanted to see what was going on at a bacterial level with the cheese and the results I got were so discouraging I ended up tossing everything out and abandoning the project. I realized I would never make great cheese unless I could devote my life to it. By comparison, fresh cheese is easy and quick and requires nothing special in the way of tools. With great milk you can make excellent cheese at home simply because you can control the quality of your ingredients and consume the finished product at its best. Most recipes for making fresh cheese call for setting it with an acid such as lemon juice or vinegar but in the spring, when the milk is this delicious, I prefer an unsalted, rennet-set cheese. I don’t want the tangy, slightly sour taste of acid-set cheese because that would mask the beautiful natural sweetness of the milk. This cheese is delicious with fresh spring vegetables like fave, peas and asparagus. I love it with fresh pasta, stirred into a spring pea risotto or simply drizzled with honey for dessert. If you grow your own herbs, a combination leading straight to heaven is fresh sheep’s milk cheese with coriander flowers and chive oil. Later in the season, as the milk takes on the stronger notes of animal, grass or hay I prefer a salted, acid-set cheese. Salt and acid both help to make the most of these stronger flavors. But usually by then I am more interested in buying one of the many traditional cheeses I mentioned above, preferably in their mountain farmhouse (alpage) versions. Fresh cheese is all about sweetness and spring for me. Start with the freshest milk you can find from pastured animals and a trusted source. Choose raw or pasteurized. Both work and I won’t enter into the controversial raw versus pasteurized fray here except to say, if I can find it, raw milk from a trusted source is my choice. To make an informed decision about what is best you can find lots of information on the internet. 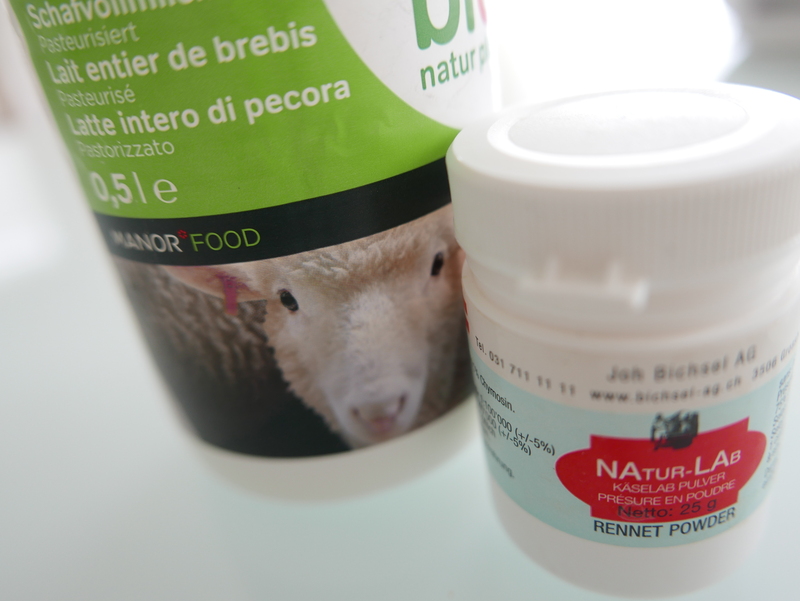 Rennet is found online or in local health food stores, supermarkets and agricultural cooperatives. You can even make your own vegetarian rennet from the thistle plant. Making rennet-coagulated fresh cheese is like making gelatin. You simply warm your milk to a specified temperature, dissolve the rennet in it and let it set before cutting the curd and transferring it to cheese mold or cheesecloth-lined sieve. Let the cheese drain for a few hours or even overnight in the fridge. The larger you cut your curd, the softer and more delicate your cheese will be. The smaller your curd, the more whey is released and the richer and creamier it will be. Personally, with milk as good as it is now, I prefer to leave my curds quite large for a delicate, tender cheese that is reminiscent of the milk and rennet-sugar pudding called junket I grew up with. Whatever you do, don’t throw out the whey. Keep it in the fridge for up to a week or freeze it. It has many uses from baking to making lacto-fermented vegetables and cooking grains. Over the years I have even discovered I can use it instead of rennet as a coagulating agent to set my next batch of milk. Finally, enjoy that cheese while it is fresh. Like homemade mozzarella and ricotta you can even eat it warm, its delicious. It will keep for a couple of days in the fridge, but it will never be as good as it is the day it is made. Obviously a sheep produces less milk than a cow but because their milk contains more fat and milk solids it can produce more cheese. Sheep’s milk can produce up to 20% its weight in cheese versus 9 to 10% for goat and cows milk (depending on what kind of cheese you are making). This make sheep economical animals for grazing, especially adapted to Mediterranean countries where the abundance of lush pastureland is not as common as it is in Norther European countries. This fresh cheese was made from 400 ml of sheep’s milk and it weighed 250 grams. As it drains, it will get a little drier. Cutting the curd. The larger you cut your curd the softer and more delicate your final cheese will be. The smaller your curd the more whey will be released from it and the richer and creamier it will be. Personally, with milk as good as it is right now I prefer to leave my curds quite large for a delicate , tender cheese that is very similar to the rennet milk pudding or junket I remember from my childhood. Late summer in the high pastures of Abruzzo. Start with the freshest milk you can find from pastured animals and a trusted source. Make sure everything you are going to use is scrupulously clean. In a saucepan, stirring continually over low heat, bring the milk to the specified temperature (see note). Cover and let sit until the milk coagulates and you can cut it. This is usually about half an hour for me, but it will depend on your rennet. Transfer the curds to cheese molds or a cheese cloth lined sieve. Use the directions that come with your rennet to know how much to use and heating and coagulation times and temperature. You will need to use a thermometer to determine the milk has come to temperature before adding your rennet. The larger you cut your curd the softer and more delicate your final cheese will be. The smaller your curd the more whey will be released from it and the richer and creamier it will be. The longer you drain your cheese the denser and dryer it will become. Finally, enjoy that cheese fresh. It will keep for 2 or 3 days in the fridge, but is best the day it is made. Thanks Jo-Anne! It will be even better with that fresh asparagus from your garden! !